Maputo, formerly known as Lourenço Marques, is the capital and largest city of Mozambique. Named after the river Maputo, the city is a large port on the Indian Ocean, also known as the City of Acacias, because most of its large avenues and streets are lined with acacia trees. 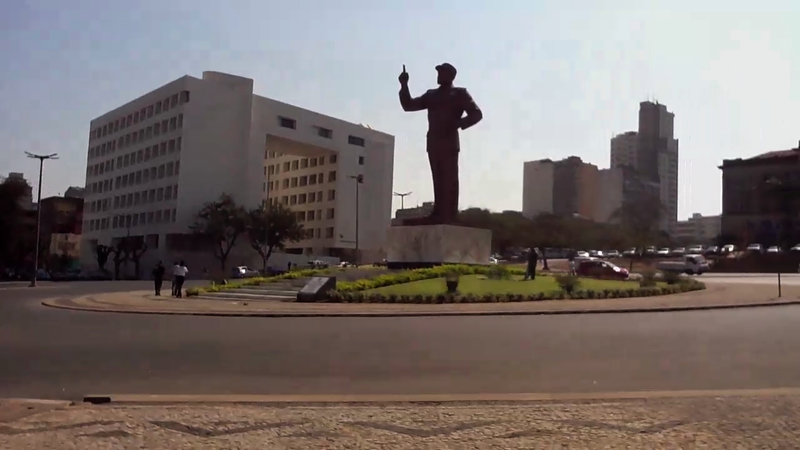 Driving or walking through the city, its rich and mixed history is immediately revealed by some prominent street names: Avenida Karl Marx, Vladimir Lenine, Friedrich Engels, Mao Tse Tung and Kim Il Sung remind us of Mozambique’s socialist past and the one-party state based on Marxist principles it became after independence in 1975. An important street in Maputo is Avenida 24 de Julio referring to Mozambique’s independence day and the beginning of Samora Machel’s reign as the country’s first president. Machel’s time in power (1977 until his assassination in 1986) marks the socialist period of Mozambique and the beginning of a long and violent civil war between the opposition forces of the anti-Communist RENAMO rebel militias and the Marxist FRELIMO regime of Samora Machel that lasted until 1992. Hence the city also has numerous street-names referring to the war, it’s heroes and victims. Many of these streets line the route I took through the city in a tuk-tuk (a three-wheeled motorized vehicle used as a taxi), freely zigzagging through central and south Maputo ending with a long drive along the Avenida da Marginal, a boulevard on the verge of the Indian Ocean. I filmed the ride on an iPad and made the video Mobilarte (12 minutes, 2014), a short travelogue that has the characteristics of both a mobilementary and a video poem. 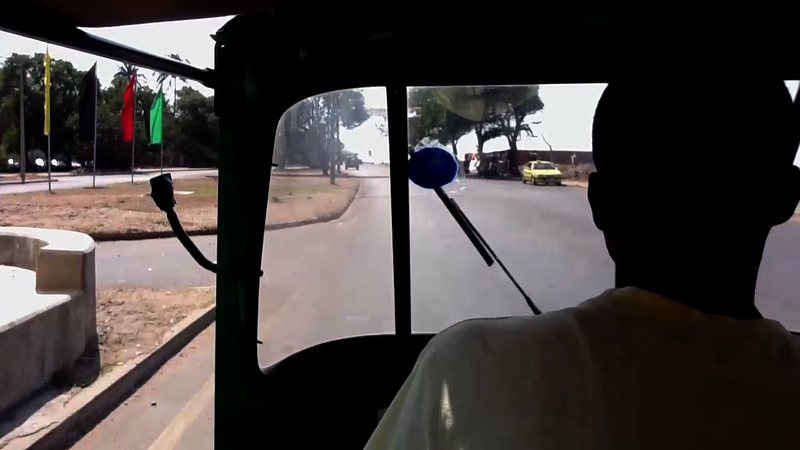 The main idea behind Mobilarte was to translate the experience of riding a tuk-tuk in Maputo into an experiential video. As an avid traveller I have lots of experience exploring foreign cities by foot, as I did when I was visiting Maputo the first time in 1999. 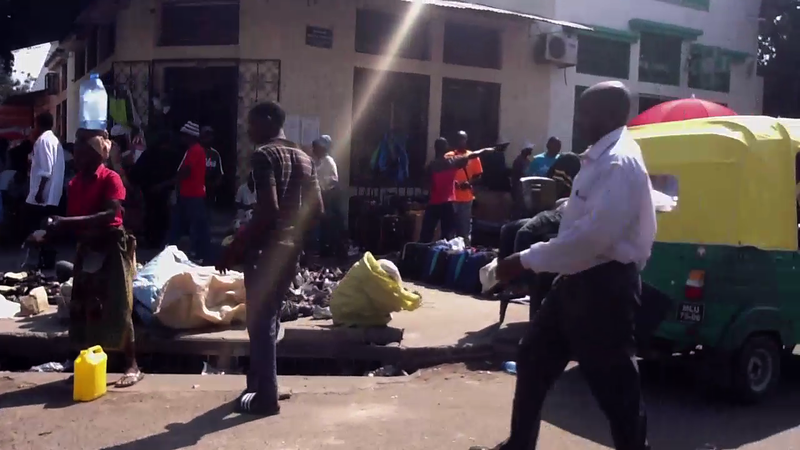 Returning to Maputo in 2012, I found the city completely changed. It had made a big leap forward straight into the 21st century looking much more like any big city in the western world. Among other changes, thanks to a huge influx of formerly leased cars from Europe, Maputo had turned into an expansive (and expensive) shiny car park.1 Another new feature was the presence of tuk-tuks or auto-rickshaws2: these three-wheeled cabin vehicles had become the most popular taxis in Maputo, most of them are coloured yellow or green or plain yellow (Figure_03). Figure_02: Yellow tuk-tuk on Avenida 10 de Novembro, with view on Catembe in the distance (Mobilarte (2014), digital frame capture). The advantage of travelling by tuk-tuk, over traveling by foot, is that you can cover a much larger area in a shorter amount of time (they are fast and travel easy through traffic jams). Compared to traveling by car, you are actually much closer to pedestrians as the tuk-tuk is completely open (if you don’t pull its curtains closed) and you will experience all the sounds and smells of the city (be it mostly car fumes), including feeling every single pothole of Maputo (tuk-tuks are not known for having a superior suspension system). This all became part of the rather shaky hand-held aesthetic of Mobilarte, as the entire ride was filmed with an iPad. The trajectory taken by my tuk-tuk driver Chris resulted in a piece that has three parts, each dedicated to a different part of town: uptown or Maputo Alto, downtown or Maputo Baixa and a third part titled Maputo Praia that follows the Avenida da Marginal parallel to the bay of Maputo, with its beautiful north-east beach3. One of the most appealing features of shooting on iPad is the fact that it functions as extra large viewfinder. Contrary to other video cameras, DSLR cameras or cellphones, the iPad offers an instant preview of what you are filming as big as its entire screen (approximately 8×6 inches). Seeing the filmed image this big while filming, is mesmerizing, and I always find myself looking more at the iPad screen then at what I am filming. In fact, the iPad gives you an instant mediated experience of reality, an extended version of reality that sits as a layer on top, as a future image in the making – hence my alternative use for “padding” in the term “eye-padding”. The iPad offers a double window on the world, both as a camera and a screen, what makes the actual filming experience all the more captivating and inspiring. Besides the pleasure of shooting with the iPad as a large size viewfinder, from my very first experiences with the tablet I fell in love with its particular aesthetic qualities that are created by its technical limitations: a slow shutter speed that cannot keep up with fast motion, automatic exposure that is slow reacting to sudden changes in light conditions (e.g. from shadow to light), a fixed wide angle lens and a wide frame (16:9 aspect ratio) and a low resolution image that easily pixelates when there is movement in the image. Although some of these technical characteristics of iPad video can be seen as “unprofessional” or “sub-standard”, for me they offer possibilities to create effects that would not be possible with “better” cameras, and these effects are particularly suited to translate the transient experience of traveling in a foreign city as is the case in Mobilarte. For instance, iPad images have interesting “motion blurs” when driving fast: its camera cannot capture the motion at the speed that the vehicle is going, especially not when filming lateral travelling shots of objects in close range. A good example is the rather messy look of the vegetation along the road in the third part of Mobilarte (Maputo Praia), that makes for rather impressionistic painterly images contrary to a more vérité shooting style. Another aspect of iPad video is that changing the frame rate in post-production from 30fps to 24fps (film speed) creates ghost frames that give the overall piece a bit of a haunted feel. This feature is an important aesthetic device in the second part of Mobilarte, Maputo Baixa, in which I tried to re-create my experience feeling ill at ease in this more crowded and older part of the city, visualizing a lingering sense of danger. Lastly, the fact that the eye of the iPad camera reacts slowly to changes in light-conditions became an important tool to visualize the African winter-light in Maputo. Contrary to the well-known images of Africa in a blazing sun, the light in the southern hemisphere in winter is a gentle soft light (the days are short, the sun is low). In Maputo this light was even softer as it is filtered in two different ways. Because winter is the dry season, there is a lot of dust in the air that softens the light. 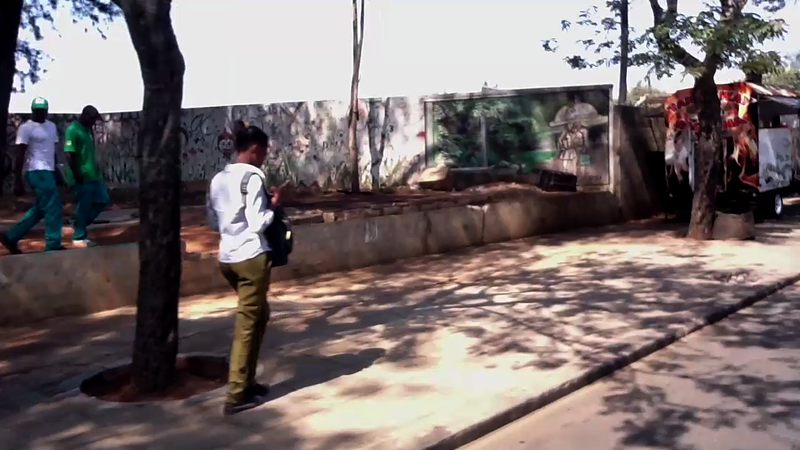 A second filter were the screens provided by the city’s many acacia trees that line the streets of Maputo: their feathered foliage creates beautiful lace-like patterned shadows that are present throughout Mobilarte, most prominently in the first part filmed in uptown Maputo, Maputo Alto (Figure_03). Figure_03: Acacias casting lace-like shadows on the sidewalks in up-town Maputo (Mobilarte (2014), digital frame capture). Mobilarte has three different parts that each portray a different part of the city and tell a different story that reflect my personal experiences and observations when visiting Maputo in the summer of 2012. 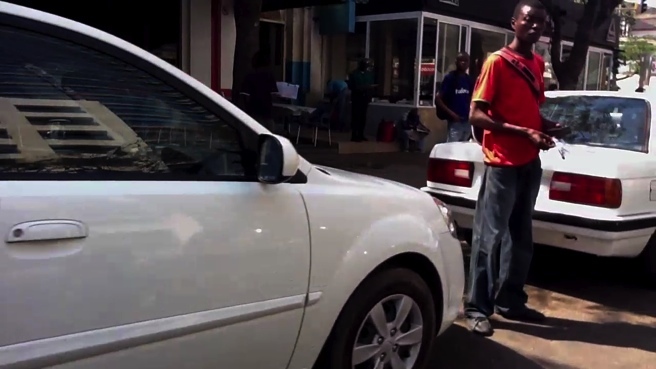 The first part of the video, Maputo Alto, is more informative and in style closest to a typical travelogue. 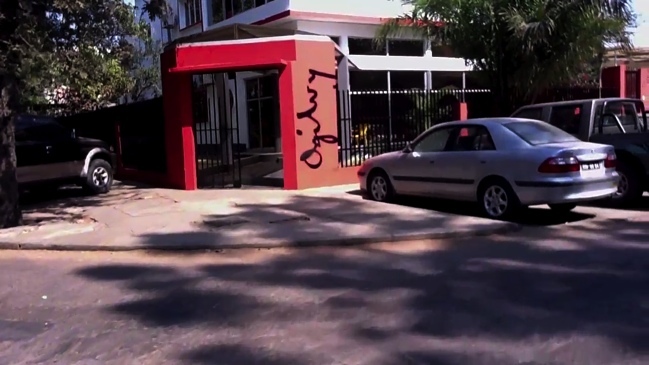 It is filmed in the neighbourhood around the central hospital of Maputo, a city block situated in between Avenida Julius Nyerere, Avenida Mao Tsé Tung, Avenida Vladimir Lenine and Avenida Eduardo Mondlane on which the main entrance to the hospital is located. 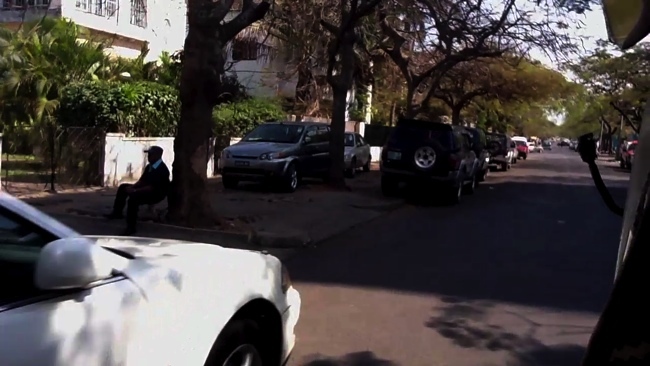 The block described here is much larger than the part of the ride that serves as the basic tracking shot for this chapter of the video, which was basically only three streets long situated closer to the hospital itself, but scenes and various brief shots of streets alike filmed in the larger area were used to create a more varied visual narrative that tries to express two main features of the “Maputo experience”: the fact that people constantly seem to appear out of nowhere and the fact that Maputo had become a city of cellphone-users. The first feature, people constantly emerging out of nowhere, was enhanced in the final video by intercutting bystanders and pedestrians of similar street scenes in the extended neighbourhood, into the selected part of the tuk-tuk ride that serves as the visual guide-track for this part of Mobilarte. 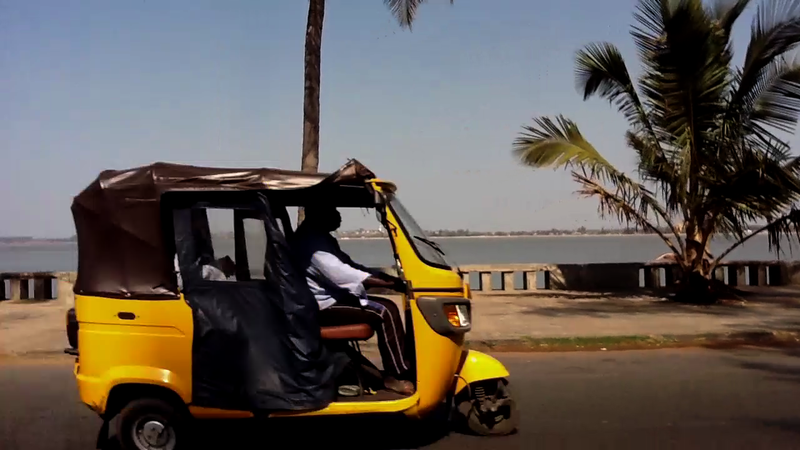 Although this creates various jump-cuts4, the similarities in the movement of the tuk-tuk (its speed and particular manoeuvres such as turning a corner) as well as the careful matching of the inserted shots regarding light conditions (sun or shadow) and view (close-ups or wide shots) makes that the flow of the video is not affected (Figure_04, 05). I chose this particular style of figurative jump-cutting because it is the perfect illustration of how a combination of lived experience (what we see) and memory (what we expect to see) enhances change-blindness or the inability to detect changes to an object or a scene in moving images across cuts. Although this will definitely not be the case for all viewers and in all cases where I made cuts by combining shots of different streets as if they were taken at the same spot, the overall effect works: despite that some visual details and object or subject properties are not retained automatically from one view to the next, we perceive the ride as happening in a stable continuous world. Change blindness is an interesting feature in moving images and as Simons and Levin describe, “perhaps the most intriguing precursor to contemporary studies of change blindness comes from the informal observations of film makers and editors.”5 Filmmakers are the natural experts in change-blindness as they work with a rich body of knowledge about perception and vision and use this knowledge to do explicitly in a film what our visual system automatically does in reality: to combine a series of partial views (individual shots) into a coherent whole (a continuous scene) without audiences noticing the transitions. A lot can be learned from the early editing experiments by soviet filmmaker Lev Kuleshov (1899-1970). He noted: “convincing montage makes the audience overlook minor defects (for example when the actor’s costume changes between shots), though I repeat that this is only possible if the scene is edited correctly (in case of bad montage the blunder will leap to the eye).”6 Mobilarte has examples of both “good” and “bad” montage, yet what is good or bad seems to be different for every viewer depending on their own experience with busy city streets and views similar to the ones in my video. 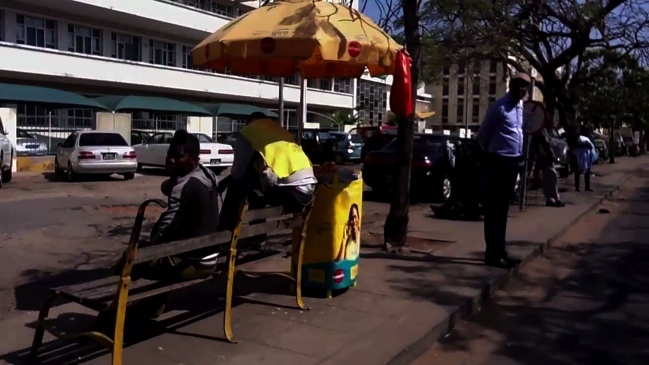 The impression that I tried to convey with this style of editing based on the principles of change blindness was my experience of the busy city streets of Maputo where people constantly seem to appear out of nowhere. To achieve this, I had to eliminate another new feature in present-day Maputo, one that I consider to be a major image contaminator: the abundance of cars in the city. Trying to avoid that my video would look like a car commercial or a promotional video for car export deals in Africa, I tried to replace as many parked cars by people as I could. It is actually a disadvantage of traveling by tuk-tuk that all the traffic on the streets, as well as all the parked cars that line the streets, dominate the tracking shots, which is not the case if one would explore the city by foot. Yet, at times I also used the cars to my advantage, and applied the same technique as above to speed up the action by intercutting cars of similar colours. To compensate for the many cars that give the city a very western appearance, I also created a scene showing only the typical pushcarts and cut them based on the same principles of change-blindness, combining carts that were filmed on very different streets (Figure_06). 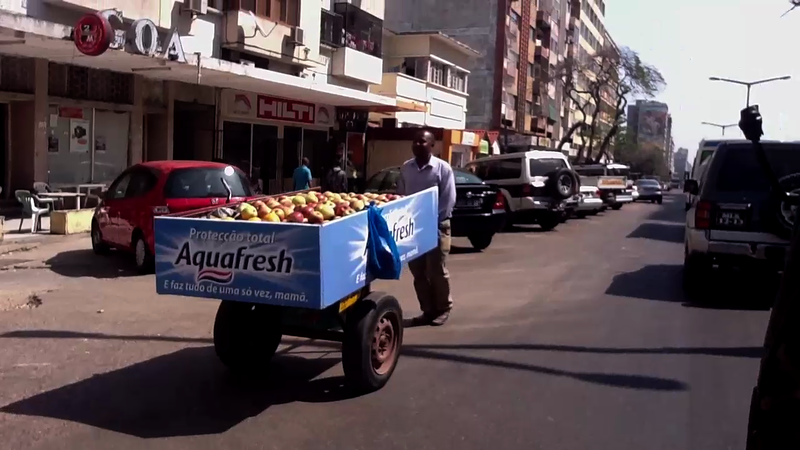 Figure_06: Typical fruit cart going against traffic (Mobilarte (2014), digital frame capture). Last but not least, this first part of Mobilarte has as second major theme the omnipresence of cell-phones and of publicity for cell-phones and calling cards in Maputo. Many street vendors wear the yellow jackets or have the vibrant yellow-and green signs of the biggest (government owned) cell-phone company at their stands: mcel or Mozambique Cellular8. This company has advertisements all over the city, some covering entire walls of skyscrapers. I also slowed down the part of the ride passing behind the central hospital to focus on this new feature of people talking on their cellphones, and inserted one of mcel’s ads, shamelessly using their slogan to promote cell-phones to iPad filming and tuk-tuk traveling: “it connects you to the best in life” (see figure_07). Maputo Baixa: lingering people, images and memories. A key moment in this part occurs when the iPad camera captured a sunbeam: as a flare it moves along the trajectory of the tuk-tuk, pointing out people on the sidewalk as if a higher power is at work. This beam of light allowed me to maintain continuity while cutting shots together that are not continuous, as the movement of the flare makes it so that change-blindness can do its wonders, enhancing the feeling of fleetingness that is already the main characteristic of this chapter (Figure_08). Figure_08: A beam of light gliding along the tuk-tuk as captured by the iPad, touching pedestrians and vehicles along its path (Mobilarte (2014), digital frame capture). After a last turn around the corner, the tuk-tuk ride for this chapter ends with a slowed down tracking shot along a crowded side-walk full of vendors that is no longer intercut with repetitions of its own images, letting the view make its own impression, ending with as shot of people crossing the street along a puddle of water. This time it is the puddle that reflects the pedestrians as if they are hanging in the air, mirrored in a similar natural way as the man in the famous Henri Cartier-Bresson picture titled Behind the Gare St. Lazare (1932) often cited as a key example of his “decisive moment” approach to photography (Figure_10). Although already a decisive moment of sorts, in Mobilarte, an even more decisive moment comes right after, when, as the pedestrians have walked around the puddle, first a women gestures and commands the tuk-tuk driver to drive along and pass her followed by two young men who pass in front of the camera. 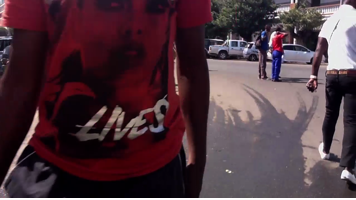 The shot ends with a close-up of a face printed on one man’s T-Shirt that reads “lives”. Although on the T-shirt the word “lives” is used as a verb to state that the person depicted on the fabric lives, I always read and interpreted “lives” as the noun referring to existences and beings, such as all the (at times ghostly) presences we just passed by on our way through downtown Maputo (Figure_9). Figure_9: Capturing fleeting impressions of figures and faces, as stated on a by-passers’ T-shirt (Mobilarte (2014), digital frame capture). Maputo Praia: poetry, fabrics and fleetingness. The third part of Mobilarte is the most poetic of the three and it functions as a sigh of relief after experiencing the hustle and bustle in the city of Maputo itself with a trip to the beach. It is the least edited part of the video and the long travelling shot along the Avenida da Marginal is almost kept as one continuous shot, be it playing at different speeds. Towards the end, when the shot is slowed down, it becomes a similar staggering image as we have seen earlier in the film due to the difference between the shooting and editing frame-rates (respectively 30fps and 24fps), be it more pronounced this time. The higher speed of the tuk-tuk itself here (it can go faster as this is a bigger road, not a small crowded city street) has as effect that the low-resolution iPad images become more pixelated, creating impressionistic views of the vegetation along the road and the wide-open views on the beach. Yet the main poetic feature of this last part of Mobilarte is how the iPad recorded the fabrics, table cloths, dresses and African wax prints that are hanging everywhere in trees or on cloth-lines along the road, on display for interested buyers. With the beach in the background, the display of clothes and colourful fabrics or batiks is simply a lust for the eye. Mobilarte ends with an extremely slow-downed shot of tablecloths floating in the ocean breeze, as if they are waving us goodbye and are already pointing us in the direction of that moment when our entire visit to Maputo will be only a memory, a reminder that all moments (past or present) are fleeting memories in the making (Figure_10,11). Indeed, a quote of Tenessee Williams ends the film reminding that “life is all memory, except for the one present moment that goes by you so quickly you hardly catch it going.” While riding a tuk-tuk tends to make all the present moments going even quicker, the iPad has proven to be a helpful tool to both catch them going, as to memorize them. 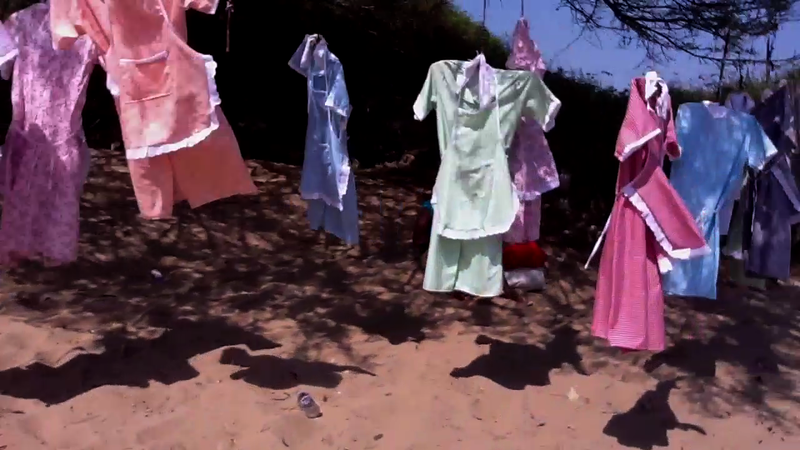 Figure_10: Dresses and aprons hanging from the trees along Avenida da Marginal (Mobilarte (2014), digital frame capture). 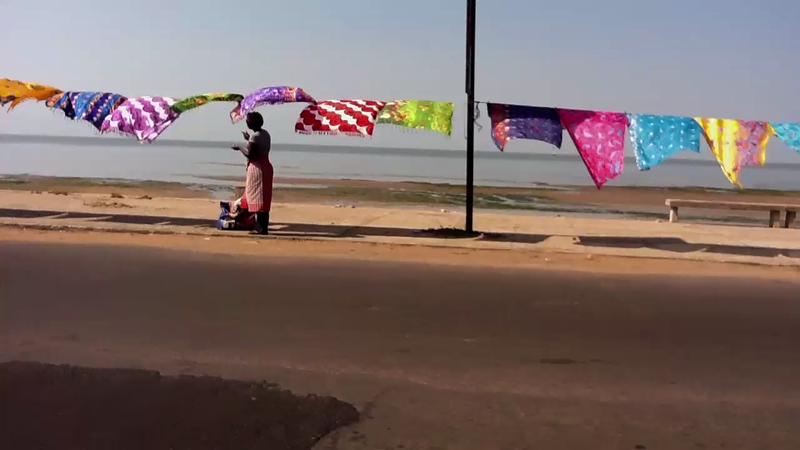 Figure_12: Fabrics for sale along Avenida da Marginal with the beach in the background (Mobilarte (2014), digital frame capture). The editing strategies for the images explained above were all carefully chosen with as purpose to recreate the experience of my tuk-tuk ride in Maputo, incorporating ideas about how memory and visual perception work, freely blurring the thin line between the real and the surreal. For the composition of the soundtrack I did something similar, but I took this idea to a different level. In collaboration with sound artist Dafydd Hughes, we composed a soundtrack that is based on the four national colours of Mozambique: red, green, yellow and black (Figure_12). In Mozambique’s flag these colours have different meanings. Red represents Mozambique’s struggle for independence, green symbolizes the land, yellow stands for the mineral wealth of the nation and black represents the African continent. Dafydd Hughes took very small portions of the original sound of the images, mostly the tuk-tuk sounds, and created with this four different notes, that each were attributed to one of the four mentioned colours. Higher notes for yellow and green, lower notes for red and black. He then wrote a special program that allowed us to let the computer scan the edited images of Mobilarte (similar to how a squeegee would vertically pass over a window) creating a signal if one of the four national colours were hit or “switched on”. These signals were connected to the four notes created for the four colours and as such a musical composition was created for the first and last part of Mobilarte, Maputo Alto and Maputo Praia. Figure_12: four flags in Mozambican colours (green, red, black, yellow) along the way, captured from inside the tuk-tuk (Mobilarte (2014), digital frame capture). Figure_13: Inspiration for the title of the video captured during the ride (Mobilarte (2014), digital frame capture). Schleser makes a comparison with how the cinematic experiments of the 1920s broke away from convention and explored the possibilities of a new film aesthetic before the term documentary was established and institutionalised, such as Dziga Vertov’s Man with a Movie Camera (1929) and Walter Ruttmann’s Berlin Symphony of a City (1927). It is no coincidence that the films mentioned are both also city films. I could have discussed Mobilarte here as a city film by explaining how the piece portrays life in Maputo, but it seemed more useful to explain the piece’s aesthetic qualities and all the artistic decisions made in the process of making it. Interesting enough, that is also why the piece does qualify as a mobilementary. Schleser uses the term documentary “to a format before it was defined, illustrating the opportunity for users, pro-d-users, filmmakers and artists to explore the new emerging possibilities of mobile video” while he defines mobile as “an open approach to work with mobile devices within the framework of documentary.” Mobilarte is probably less “mobile” than other mobilementaries, because it was edited on computer and not on the iPad with its own editing software. As it aligns itself with travelogues and experimental film, I chose the title Mobilarte (mobile art). In any case it was meant to be both mobile (made on the move) and moving (made to move) (Figure_14). 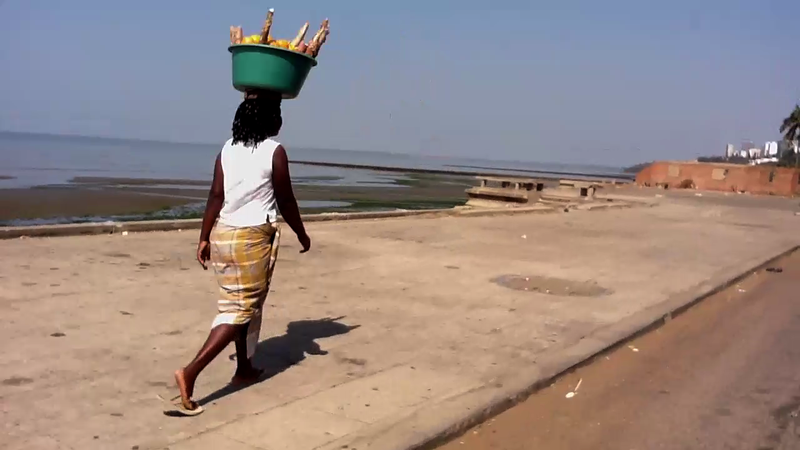 Figure_14: Woman walking towards the centre of Maputo along Avenida da Marginal (Mobilarte (2014), digital frame capture of an out-take). 1 Used cars are one of the biggest import products for Mozambique. It is for many used car companies their fastest growing market in South-East Africa. Mozambicans can choose from a wide variety of formerly leased Japanese vehicles such as Toyota, Honda, Mazda and Mitsubishi. But European cars are popular too. Importing used cars into Mozambique is very easy. There are no major restrictions, and the port of Maputo is easy to access, although some companies prefer Durban as shipping is a bit more frequent there. 2 Also known as three-wheeler, Samosa, tempo, trishaw, moto-taxi or lapa. Tuk-tuk is a term commonly used in Thailand, an onomatopoeia for the sound of the vehicle’s two-tact motor. 3 The making of Mobilarte took two years. Part 3 of Mobilarte, Maputo Praia was the first part finished and it was selected for and screened at the 2013 edition of MINA, Mobile Image Network Aatearoa, New Zealand. 4 An edit of two sequential shots of the same subject that are taken from camera positions that vary only slightly which gives the edit the effect of jumping forwards in time. 5 Daniel J. Simons and Daniel T. Levin, “Change Blindness”. Trends in Cognitive Sciences, Vol. 1, No. 7, October 1997: 261. 6 Lev Kuleshov, Selected Works: Fifty Years in Films (Agrachev, D. and Belenkaya, N. tranlators). Moscow, Raduga Publishers: 1987. 7 Simons and Levin, 1997, op cit. : 267. 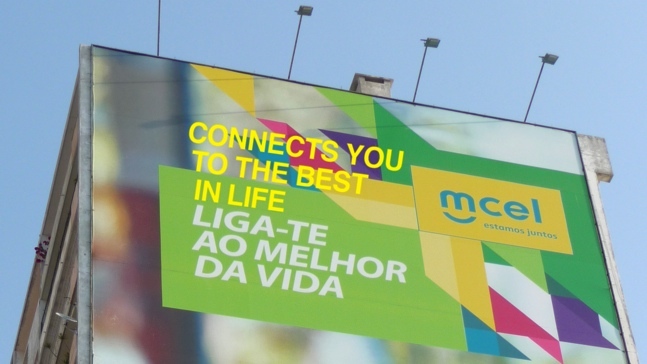 8 Mcel is Mozambique’s largest mobile network. It is 100% owned by the government. It began operating in 1997. In early 2012 mcel claimed to have more than 4.5 million subscribers, and a mobile network that covered 75% of Mozambique’s population, and 60% of the country’s territory (http://infoasaid.org/guide/mozambique/organisation/mcel). In 2005 the company teamed up with media giant Ericsson to reinforce its position as market leader in Mozambique and to expand its services (http://www.ericsson.com/article/mcel_1595655422_c). Their main competitor is Vodacom, a pan-African mobile telecommunications company that has its most subscribers in South-Africa. 9 Because this is a video effect that depends on the interlacing of the image, it cannot be shown as a still. 12 Max R. C. Schleser, Mobile-mentary : Mobile Documentaries in the Mediascape. Saarbrücken, Lambert Academic Publishing : 2011. 13 Max Schleser, op. cit. : 235. 14 Max Schleser, op. cit. : 136. 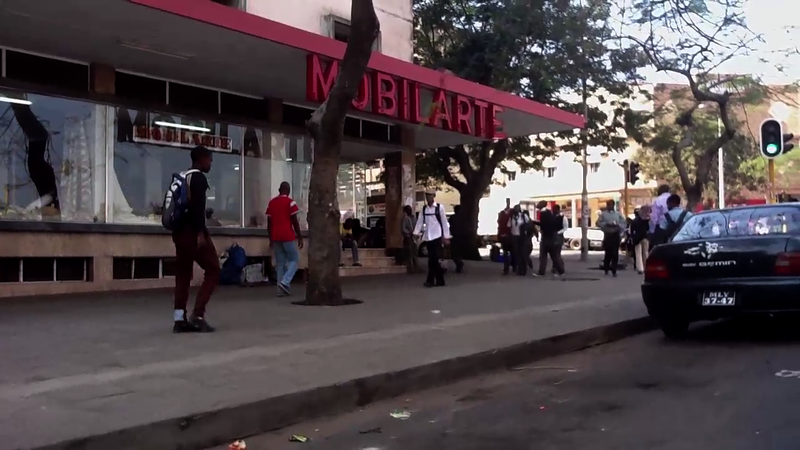 The Mobilarte title hints at the fact that this is a film  shot on a mobile filming device and the subtitle Maputo was helpful in establishing the location. I watched this film twice, and both times I experienced pleasure in watching, appreciated the light, colour and sound, the linear quality of the travelling shots, the doubling back and on occasion superimposition, which I read as a temporal going forward with loops backwards and forwards through present and past, but also memory in a form of flashbacks. The images are aesthetically beautiful and I felt I was pulled along and then able to double back to reflect on what was just seen and what will still come. The rhythmic tone of the sound worked well with the editing of the image to create a sense of haunting. This enriched the viewing experience. I noted the streets were full of cars in the first two parts of the film – this was also mentioned in the text as an aspect of modern city life that had changed since Cammaer’s last visit in 1999. I noted people were wearing t-shirts with brand names, using mobile phones and the streets were very busy (except for the 3rdsection on the beach). In the second viewing I noticed more detail and having read the text looked out for some of the things mentioned. I observed the contrast between the more opulent central city in the first part contrasting with the second part, which was clearly the poorer part of town, with scruffier streets, sprawling market stalls spilling out on to pavements; people rambled through the streets and in both sections city life was dominated by cars. A journey mediated through a car or train window showing a landscape always just out of reach has always lulled me (and perhaps other spectators) into a sense of spatial distanciation leading to the tendency to dream while awake and then often to fall asleep. In the film this was deepened by the dreamlike images intercut throughout the film and the changing frame rate led to a haunted and nostalgic feel, referred to in the text. The Tennessee Williams quote at the end of the film is particularly apt and underlines the spectatorial sensation of mourning for both past and present, particularly in the empty spaces in the last part of the film. The third part of the film, the beach sequence, was much more linear but my reflections varied from the discussion of this section in the text. It did begin to form a narrative albeit a very slight one but while the text discussed the materials blowing in the wind I thought about the beautiful empty beach. Images of materials flapping on lines, and a few forlorn tourist stalls with no customers, combined with the spatial emptiness led me to reflect on the fact that there are very few empty beaches in the world now, that tourists have taken them over often to the detriment of local inhabitants who become economically dependent on the tourist trade. I concluded there are very few tourists in Maputo. The tablecloths and prints hanging in the trees, blowing in the wind evoked a cinematic moment, or as David MacDougall might describe it, neither signifier nor signified but pure filmic sensation, a pleasurable feeling, which, countered by images of the pristine colourful party dresses – because the beaches were empty – gave me a deep sensation of nostalgia and loss. Much of the information about Maputo and its history now and in the past in the text is informative but does not connect very clearly with the film. The methodology sections were stronger in that respect. The use of the iPad as a means of filming and the possibilities of particular effects through changes of frame rates, difficult to achieve by other means, gives a very interesting insight into the effect on the maker while filming, of feeling that at the point of filming, she is already a spectator: “the iPad gives you an instant mediated experience”. This was unusual and fascinating. In providing a double mediation, the filming experience with an iPad may be a captivating and inspiring experience for the filmmaker, but there is also a danger of objectifying human beings caught by its frame and this led me to thoughts of ethical concerns in a more general sense. Cammaer’s analysis of the images of hanging materials as waving us goodbye by pointing to the past and future at the point of becoming a memory was not my own reading. I considered the colourful liberated materials to be exuberantly waving hello in the present, enjoying their freedom; but the bright hanging empty dresses I read as sad, absent and abandoned, deepened by the emptiness of the beach behind. The text refers to images of the Statue of Samora Machel, but I did not note it in either viewing. Nor did I see shots of street signs, but I was struck in both viewings times by a Stop street sign filling the frame in a sudden static image, and by the many colourful billboards. In a more immersive cinema screening than my computer screen they may be visible. The text also discusses ‘change blindness’ citing a long quote from Simons and Levin where the viewer provides continuity and ignores what is not important. The film’s travelling momentum provides this continuity but for me this was at the expense of many of the images which the text refers to as being important, particularly those that make reference to the signifiers of Maputo’s political past. The text’s main interest is in its useful discussion of the methodology in image and sound composition. I found the text helpful in deepening my experience of the film when I watched it a second time. While the text refers to the video at the start but elsewhere refers to it as a film I prefer to use the generic term film. Gerda Cammaer’s film Mobilearte is an experiential video presented in three parts, which each show a different area of Maputo, Mozambique. Riding on the back of a tuk-tuk and filming on an iPad, Cammaer demonstrates the mobility that the device affords, yet also points to the ‘instant mediated experience’ inherent in the use of a large screen. She points to the aesthetic qualities that spring from the iPad’s technical limitations, which include motion blurring that occurred when transcoding the video. She also invokes Simons & Levin’s thinking on ‘change blindness’ and utilises this concept as part of her approach to the video editing of the film; a technique that makes great practical, conceptual, and stylistic use of the single-perspective captured from the back of the tuk-tuk. 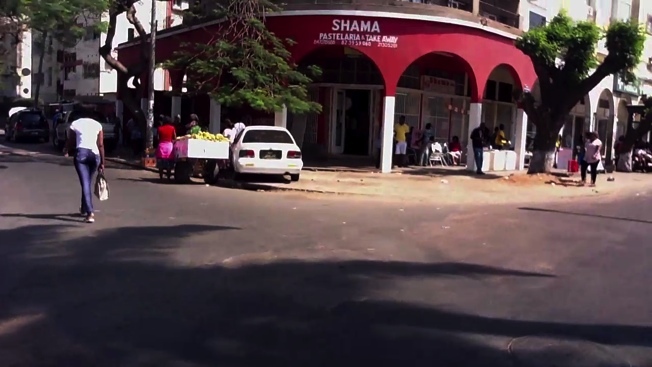 Each of the three areas of Maputo shown in the film are presented using slightly different approaches to editing and music; features that demonstrate the effect that the geography has on Cammaer’s approach to aesthetics. Perhaps the most significant aspect of Mobilearte is Cammaer’s collaboration with Dafydd Hughes to produce the music featured in the film. By scanning of the images in the film for the colours of the national flag of Mozambique, the soundtrack is automated through the generation of certain tones for each colour. Cammaer discusses in her statement the approach to music in each part of the film, including the doubling up and brief delay of the soundtrack in the final segment; a technique that clearly shows the recurring themes of ‘fleetingness’ that are also apparent in the film’s embrace of motion blur and ‘change blindness’. Cammaer discusses the approach she took to the making of the film in her accompanying text and it is clear that these are the key elements that make it a very conceptually interesting, modern, and meditative film. It is clear that Mobilearte explores issues surrounding mobile filmmaking, specifically in relation to the use of the iPad camera and the resulting aesthetic qualities of the video. Cammaer writes in her statement that she hopes ‘to contribute to the growing impact of the mobile video format as an alternative cultural form of expression, a user-friendly and user-based one’, and I believe that she has made a very strong contribution with Mobilearte. The various contexts surrounding the film’s production have been clearly defined by Cammaer and the impact that these contexts have had on the design of the film is significant. There are innovations present in the aesthetic qualities of the film as well as through the detailed discussion of Cammaer’s approach to making it. As an aside, films that feature perspectives from public transportation are rampant in mobile films, but the use of a tuk-tuk in Mobilearte is both refreshing and conceptually stimulating within this field. New knowledge is clearly evidenced in the written statement regarding the use of the iPad as a creative tool for expression. Significant knowledge springs from the exploitation of the mobile device’s strengths and limitations, including the mobility it affords, the resulting motion blur, editing to embrace ‘change blindness’, and the approach to shot length. Overall, many of the significant contributions to do with aesthetics made by Mobilearte are often very clear to viewers of the film and, along with the pronounced themes of mobility and mediation in city films, I believe it could be argued that the film stands up as a product of research on its own right. The magnitude of Cammaer’s approach to the aspects of making the film, including its soundtrack, however, becomes abundantly clear through her explicit discussion of her methods in the accompanying text. I therefore believe that the significance of the film can partly be understood by viewing it without the accompanying text, but the viewer will only gain a full understanding of its strong contribution to the field of mobile video from reading the written statement. I am very grateful for these two reviews of my film Mobilarte as they are both very thoughtful and insightful. They encourage me to continue exploring mobile cinema and make new experiential videos. The alternative reading of the third part of Mobilarte by the first reviewer is particularly inspiring. This is a useful frame of reference, as I continue to make work on the theme of travel and new mobilities, including tourism.